When Muhammad Ali—then Cassius Marcellus Clay—was twelve years old, a thief stole his new red Schwinn bicycle outside of the annual Louisville Home Show. Clay, in tears, found a policeman to report the crime to and stated that he wanted to “whup” the thief who stole his bike. Serendipitously, the policeman was Sergeant Joe Martin, who trained boxers. He encouraged Clay to learn how to fight before looking for retaliation. Martin’s gym was in the basement of the same building they were standing in. Clay showed up the next day to start training and he spent the next six years under Martin. Had young Cassius not been the victim of a stolen bicycle AND had he not taken the advice of the police officer, his life would certainly have taken a different path. Cassius Clay’s stolen bike became a catalyst for his boxing career and illustrates by example how Cassius found his purpose in life at an early age. What is a Red Bike Moment© ? This experience involving his stolen bike, became the first pivotal moment in Muhammad’s life; it became his “Red Bike” Moment. Most of us can reflect on our own personal history and identify a transformational event in our lives that occurred because of a challenge or some type of adversity. From that forward, Muhammad Ali experienced an awakening and began to seriously consider the realities of racial tensions in America and the effects of segregation and integration. At a very young age, Muhammad made a conscious decision to use boxing as a platform for social justice and peacemaking on a global basis. Muhammad Ali utilized his “Red Bike Moment”© to fight a different kind of fight that persisted while still in the ring, and continued until his passing in June, 2016. A significant component of the Muhammad Ali Center’s mission is to preserve and promote Muhammad Ali’s legacy. 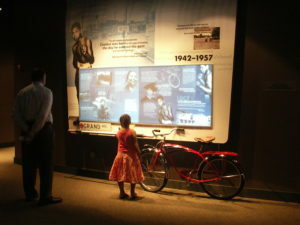 Using the “Red Bike Moment”© is a symbolic approach to fulfilling the Center’s mission in a way that connects in both graphic and tangible ways. 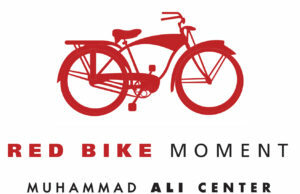 The Muhammad Ali Center encourages people to connect with and to share the notion of the “Red Bike Moment”© in their own lives. The Center provides opportunities that afford volunteer programs, charitable collaborations, on-site interactive exhibits, educational forums and activities, community partnerships, and other events that share and reinforce “Red Bike Moments”© in and outside the walls of the Ali Center. Using Muhammad Ali’s own story as motivation for positive thought and action are the powerful features that will advance both individual development and humanitarian causes, one person at a time.